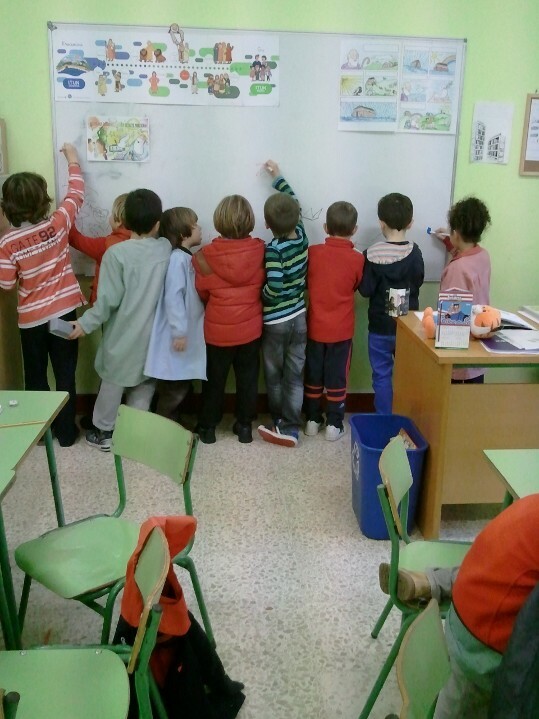 Everyone wants to write on the board! Wow, well these past two weeks have flown by! They have been full of many new experiences, challenges and joys. This post is going to be mainly focusing on my job and how I have been adjusting. The reason that we chose to move to Bilbao was because of a job offer that would allow Kanicia and I to continue to support a group or a congregation in a foreign land. So what exactly is the job? How do you like it? Do you have to speak Spanish? Let me share my experience surviving the start of my new job with you. First of all you may have noticed that I have not been posting many blog posts lately. This is because I literally have not had any time to! Coming from Murcia to Bilbao feels like moving from Mississippi to NYC! But imagine that no one in NYC speaks English. Yeah, it was a culture shock! Even within the same country. You see, Bilbao is what is considered the Basque Country so many don’t want to be identified with Spain and they have their own way of doing things. Here people walk faster, talk faster, drive faster and basically you just have to do the best you can to keep up! But with a place that is more cosmopolitan and urban also comes more variety and things to see and do. Bilbao has plenty of that as well. Pintxo bars, museums, art and parks. But anyways, let me get back to my job. We literally just got internet in our apartment today and I finally found some time to write. So where are you working? Well, I work for an Academy located in the center of Bilbao. They have two schools in a posh neighborhood of the city known as Indauxtu. I spend my time teaching between these two locations. I also teach two classes of students in a public school two days a week which is coordinated with the academy. The kids are like kindergarten age and 3rd grade age respectively. I get a classroom and I spend an hour with each of the groups. For the kindergartners I have to go out to the playground and collect all of the kids (about 15) and then lead them by the hand up the stairs into my classroom. There are some nice kids in the group. Even though I’m supposed to be teaching them English because they have such short attention spans I usually end up just playing with them for half the class and letting them color and I try to incorporate English as much as possible. I’ll tell you a secret, I don’t think they understand anything I say in English. So I usually speak in Spanish when I really want them to do something. When I teach at the Academy in Indauxtu I switch between a variety of classes. The amount of students can be from 10-15. In total the main location of the academy that I teach at has around 300 students and 30 teachers. The students range from young adults who are preparing for their Cambridge English Exams in order to get accepted to University or to advance their careers. Or I could be teaching young teenagers who are learning English in addition to what they are studying in their regular schools. I also teach private lessons with test preparation books at the academy. I also have a class with a business man who works for an environmental government agency in Bilbao. I also have another class with three business people who are executives of a large consulting company. They are learning English so that they can better communicate with foreign business people when necessary. I get to use their boardroom and they are very nice. These classes with the business people are all in their places of work. Everything is within a 10-15 minute walk from our apartment. If I take the metro it would be only a few minutes. That’s one great thing about where we live is that everything is in walking distance. So how are you enjoying the job? Well, I have to admit at first it was quite stressful. There was so much at once and while I was adjusting to my new job we were also adjusting to a brand new city and trying to find an apartment. But despite all this, I survived. I feel very happy to have a job with the way that the economy is here in Spain. The job itself can require a lot of work. 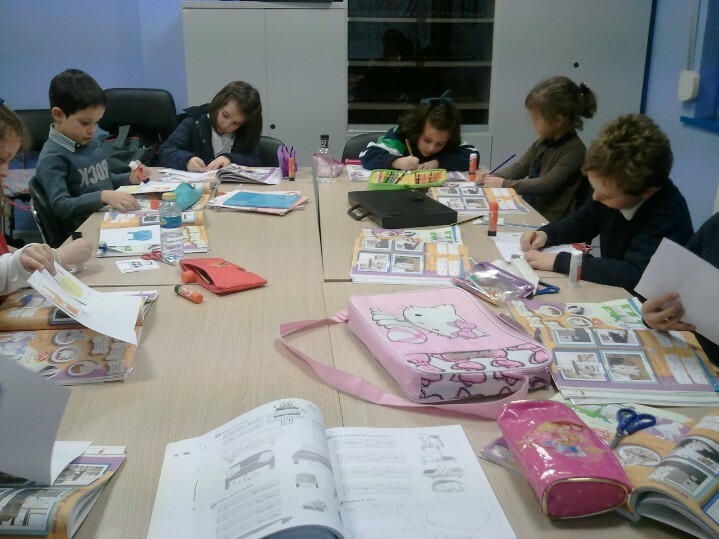 There is preparation involved for the classes and teaching little kids can be quite exhausting! 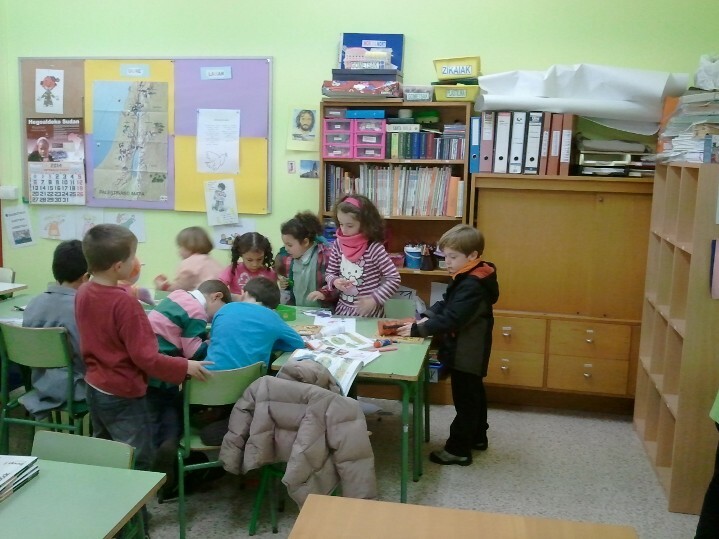 My first week I was still getting a feel for my students and for the rhythm of the classes. Since I was new some of the younger kids would start acting up. 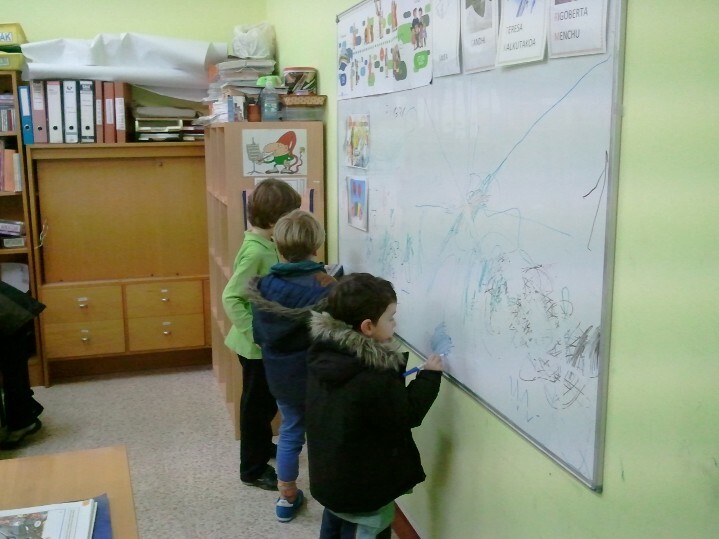 If you have never tried to control a room full of Spanish school children for an hour, let me tell you its an interesting experience… After getting some good feedback and suggestions from other teachers and the director on classroom management I started to make some changes. No more Mr. Nice Guy! Haha. Today one of the kindergartners was so mad at me I thought he was going to explode. I was like 5 inches from his face telling him “sternly” that he could not play with a certain toy because it was time to do another activity. Yeah, that was a fun class! Haha Once I showed the kids whose boss by laying out the rules and letting them know that their would be consequences there was a 180 degree difference. So despite the hectic start things are now much smoother and I am enjoying my classes more and more and getting to know and have fun with the students. 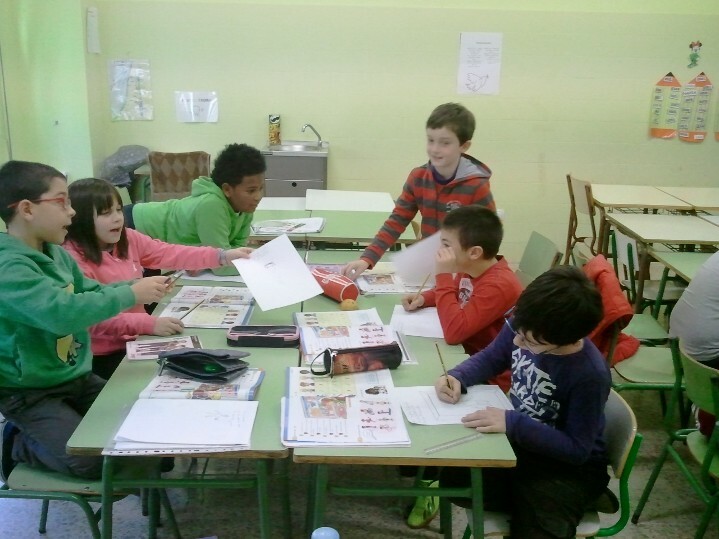 So all in all, I’m really enjoying my job as an English Teacher here in Bilbao. Some of the teachers that I worked with have worked in Japan, Ukraine, and in other parts of Europe. Here is something to show just how small the world is. The other day I was preparing for a class at the academy and I met a fellow teacher who happens to be from of all places……Santa Rosa! I could NOT believe it! So we talked for about 10 minutes and just thought how incredible it is that we are both in Bilbao, Spain teaching at the same academy! Below are some pictures of some of the kids in the public school and at the academy that I teach during the week. Hey you in the green, get back in your seat!